I mentioned briefly at the end of last year that I have a new soil mix. 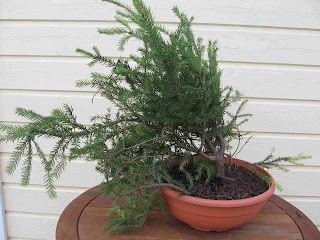 Originally I had been using cat litter and pine bark for my bonsai mix and this worked well. The cat litter retained the water that it could hold and any excess simply drained out the bottom of the pot. 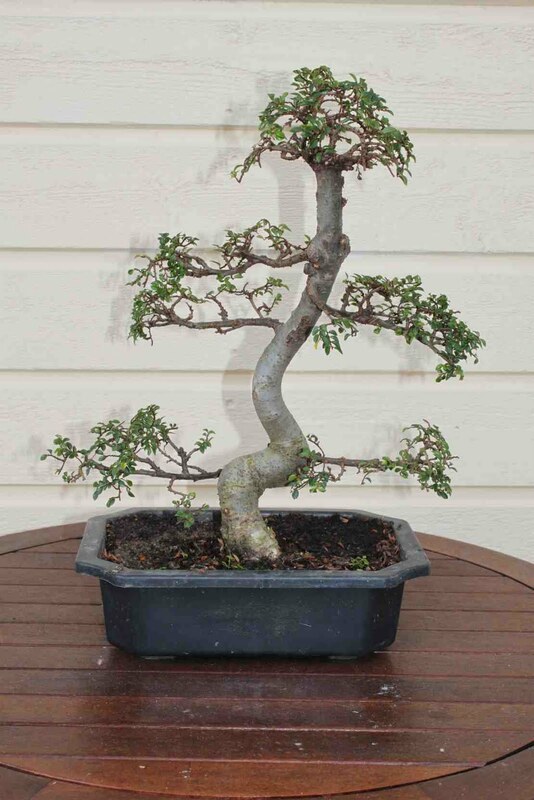 But whilst scouring the various blogs of other bonsai enthusiasts I came across an article by Walter Pall about ‘baked loam’. Walter is one of most highly respected professionals in the bonsai world and regularly travels to give training and demonstrations. Walter has been using inorganic materials for some time and with this he is producing top class bonsai that regularly win awards. So I thought what must work for Walter must surely work for me. Walter is using a product made by Maxit and even though the product code is different here in Finland the product is still the same with particle sizes of 2-4mm coming in 25kg bags. 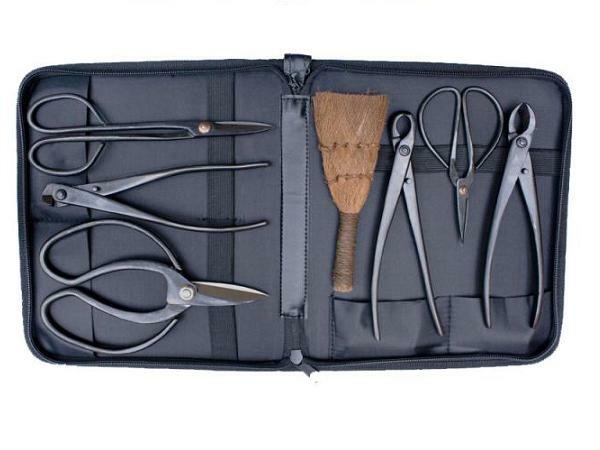 Unfortunately I was unable to purchase this from any store locally so I had to order a pallet of 18 bags directly from Maxit and have it delivered. At least now I have enough to keep me going for a few years. I am not using this Maxit product neat; I am still making a mix using 7 parts Maxit, 2 parts cat litter, to add some different colour and because I still have some bags available, and 1 part pine bark, to add some organic matter to the mix. 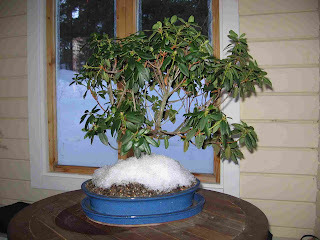 As with the cat litter earlier it is important to water and feed the bonsai on a regular basis. I am watering everyday regardless if they need it or not and feeding every couple of weeks. 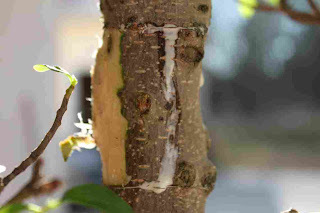 This type of bonsai ‘soil’ requires that you are daily tending to your bonsai but the end result is healthy trees and a higher survival rate. During the summer holidays I visited Helsinki. This gave me the opportunity to again visit the Bonsai and Japanese garden located near there. 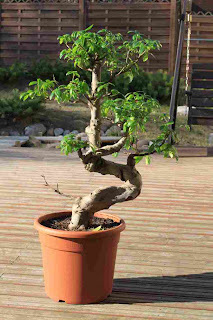 This time I decided to buy a Zelkova (Japanese Elm). Looking at the tree it was clear that it was a little overgrown but it had a decent size truck and some potential to be good bonsai. 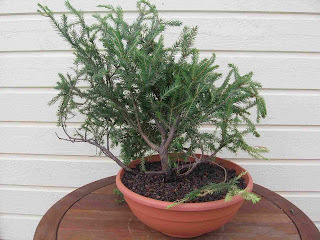 Ideally I wanted to re-pot the tree into more my own soil mix but with spring some months behind I am a little reluctant to take that risk now especially when it seems to be growing well. Instead I decided to at least give it a trim for the summer. 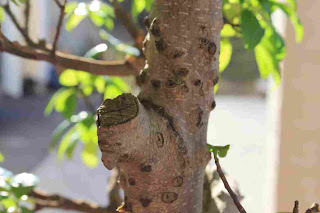 Zelkova react well to trimming at this time of year and it is good to prune back to 1 or 2 leaves to keep the shape and maintain the small delicate size leaves that Zelkova have. 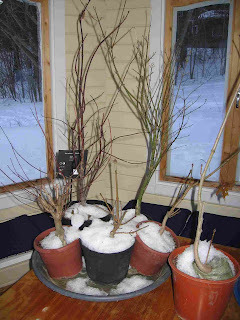 This pruning also helps back budding and since my pruning this is starting to become apparent. The next battle will be to see it through the winter. Apparently there are two varieties of Zelkova, one that is grown for outdoors and one for indoors. 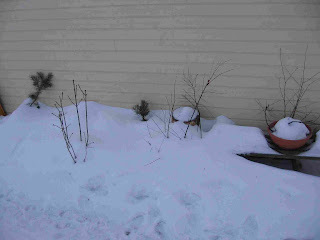 I am not sure what type this is or how to tell the difference but I am reluctant to keep this tree indoors during the winter because this can have a more negative affect than having the tree go into cold winter dormancy. I will put the tree in my pavilion during the winter months to protect it from the wind and extend the growing the season a little because of the higher temperatures created by the glass windows. 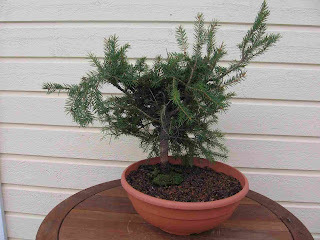 This year I will start to use fertilizers and other soil additives manufactured by SUMO BONSAI ®. 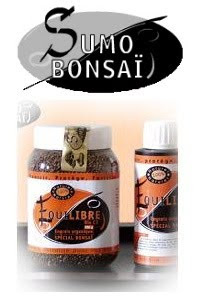 Organic fertilizers SUMO BONSAI ® are known to provide health and vitality. 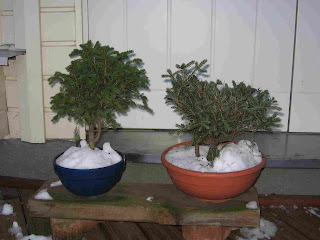 Indeed, the organic fertilizing matter is above all restabilizing, and ensures a natural nutrition according to the Yin Yang cycle, universal law of assimilation-regeneration which bonsai are also subjected to. An organic nutrition recreates in the pot, a true natural environment needed for the plant's health, its harmonious development and its natural immunity. 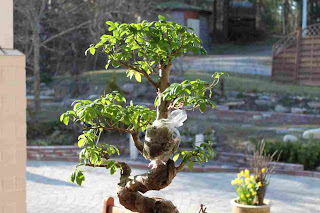 Bio-C1 is perfect for all indoor bonsai and can also be used on outdoor bonsai during the spring. Bio-C2 is a new technology fertilizer supplying high quality nutriments to bonsai fertilization and is suitable for all outdoor bonsai. Orplus is a liquid organic fertilizer specially adapted for bonsai cultivation. 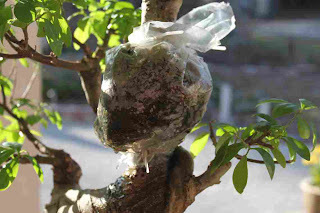 OE70 Foliaire is a nutritive, stimulative and protective foliar solution specially design for the cultivation of bonsai. Naturel Compost softens the substrate and reactivates the baterial environment. 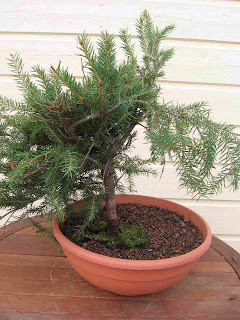 It can be used on all bonsai species, indoor and outdoor. Naturel Compost maintains the quality of the soil and reinforces the organic fertilizers' assimilation. T.O.N.U.S V stimulates the multiplication process of root cells. 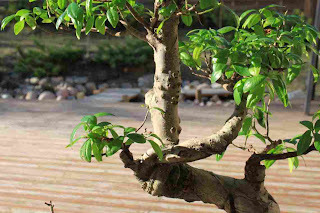 The macro and micro nutriments provided by T.O.N.U.S V strongly aid the recovery of roots after repotting and strengthen the nutritive natural cycles indispensible to bonsai. I will try to monitor how the trees repond to this new range and hopefully I am presenting nice photos of my lush trees by the end of the season. 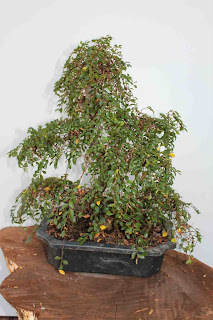 All these products are available from our webshop Raisio Bonsai and Garden. This spruce has more growth and the truck was a nice size. Once I can start to style these, hopefully next year, I hope to find hidden a nice bonsai. This is an art in itself trying to find the bonsai within a piece of material, either collected or purchased from a regular garden centre.